If you have a large lawn then keeping your lawn cut is a regular and often annoying part of property maintenance, especially if you’re concerned with the appearance of your property. 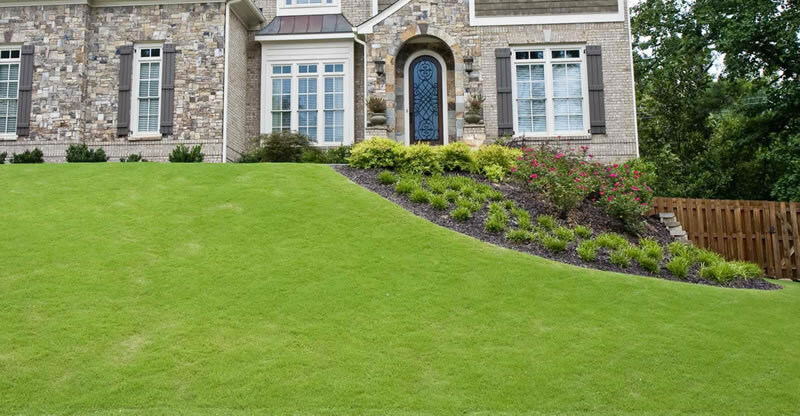 Many homeowners take pride in their curb appeal but they just don’t have the time to mow their lawn on a regular basis. This usually means hiring a company with the equipment and experience to keep your lawn cut and looking great. You’re not happy with your current mowing company? You are away frequently or just don’t have the time? Your lawn is very big and you don’t have the right equipment? You manage an HOA and need regular mowing service for your residents? You have a commercial property with large lawn areas? Green Acres Lawn & Landscape is a licensed and insured Kansas City lawn mowing company that specializes in cutting lawns for residential and commercial property owners. Whether you need a small residential lawn mowed once a week or a much larger commercial property mowed every other week we have the professional equipment and experience to ensure your lawn always looks great. Sometimes we are contacted by customers to come and mow a lawn or a large grassy area that has been neglected or has gotten out of hand with growth. We are happy to offer these one-time mowing services but it’s not like doing a normal lawn, it will cost more. If the grass is really overgrown it’s not something we can efficiently cut with a push mower. We must use professional grade equipment and it takes a lot longer and it’s also very hard on our equipment. In some cases the grass is so overgrown we’ll need to cut it with one of our ride-on mowers. If it’s really over-grown this doesn’t mean we cut it faster using a ride-on either, it takes the mower longer to cut the taller grass and we need to make more frequent trips to dispose of the grass on your property or into our dump trailer. If your property has lots of rocks, sticks, ruts or other piles of debris that could damage our mowers the cost will go up or we may even refuse to do the project. If you want a lawn with a nice clean manicured appearance it takes a little more work than just running a mower on it and then leaving right away. We include the following complimentary services with regular lawn mowing so our clients are left with a fantastic looking lawn every time we visit. High quality cut with professional grade equipment. We take the time to trim around lawn and garden edges. We blow out your garden beds and hard surfaces of any lawn clippings. Bagging and disposal of all grass clippings. Visual inspection of your property to make sure it looks great. We’ve mowed hundreds and hundreds of yards throughout the Kansas City Metro and we’ve streamlined our processes to cause minimal hassle or inconvenience for the property owner when you hire us. We offer a turn-key mowing and lawn care service, you just need to make the call and we’ll take care of the rest. We can custom tailor your lawn mowing service to ensure your lawn always gets the specific attention it needs on a regular basis. We show up on the scheduled day(s) and mow your lawn as promised (weather permitting). The end result will be a well maintained lawn with a fantastic manicured appearance. If you’d like to schedule an estimate for professional lawn mowing services please give us a call (913) 422-5111 or fill out our online form and we’ll get right back to you and schedule a time to come and view your property.